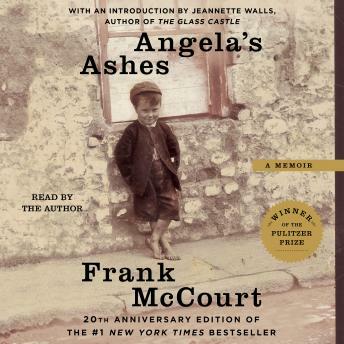 So begins the luminous memoir of Frank McCourt, born in Depression-era Brooklyn to recent Irish immigrants and raised in the slums of Limerick, Ireland. Frank's mother, Angela, has no money to feed the children since Frank's father Malachy, rarely works, and when he does he drinks his wages. Yet Malachy does nurture in Frank an appetite for the one thing he can provide: a story. Perhaps it is a story that accounts for Frank's survival. Wearing shoes repaired with tires, begging a pig's head for Christmas dinner, and searching the pubs for his father, Frank endures poverty, near-starvation and the casual cruelty of relatives and neighbors -- yet lives to tell his tale with eloquence, exuberance and remarkable forgiveness. This is a great book ... from the narration to the story line. Highly recommended. Now I can't wait to get the sequel ... "Tis". Beautifully written and narrated by the author. It is evident as to why many high schools have added this book to their curriculum. One of the best, saddest, most engaging books I've read. This book is so very sad: extreme poverty, starvation, diseases, neglect, and many dead children. The most terrible thing in these situations is the parents' neglect of their children, and their blindness and ignorance about it. Neglect that leads to many of the terrible things that happen to kids in poverty. And that leads very young children to prematurely behave and become adults, as Frank was already at the age of 5 or even earlier. So sad, so painful. The book is bleak, but what can you expect when the kids are dirty, dressed in filthy rags, starving, barely have a shack for a house, a father that drinks his weekly salary (when he has a job! ), and diseases that are overlooked by neglecting parents and get sever sometimes to the death of infants. There is also some black humor in this book, and it is funny although depressing. And of course, whomever loves this book should also read The Glass Castle. I went through a variety of emotions from laughter to anger to sadness. This has been the best read of my life thus far. A terrible life, redeemed by human tenacity. His reading makes it unforgettable. This is the third time I've listened to this memoir and I have read it twice. 'Nuff said. Loved this story. Tragic and amusing at times the story of poverty in Ireland kept me interested for 15 hours. I loved this book. The narration was excellent! I highly recommend it.